Make work projects- such as interstate and hoover dam near las vegas, dams up Colorado river generates a lot of energy. Government had to pay for it. Building of the interstates such as hoover dam (which put 100’s of thousands people to work). 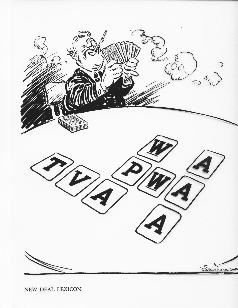 Summary: The alphabet agencies were work relief programs created by Roosevelt during the Great Depression to aid unemployed Americans. Summary:John Maynard Keynes was an economist, who invented Keynesian economics, which was used by Roosevelt in America to help through the Great Depression in the 1930’s. USA, Japan and Hitler’s Germany all use this with success.